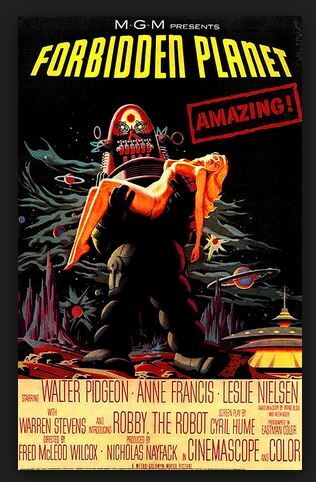 My friend recently told me that the movie Forbidden Planet (1956), the science fiction monster movie, ripped off Shakespeare’s play The Tempest. All I could say is: huh? what? I couldn’t believe this comparison, not just because they are two different genres, but one is a classical stage play and the other is…well, it’s science fiction with a big robot. Then I thought about it. I can’t deny the similarities. Forbidden Planet is The Tempest! The Tempest is one of the last plays Shakespeare wrote in his life and contains elements like magic, revenge, and classical romance. The main character is Prospero, who has been stranded on an island with his daughter, Miranda. He is also a powerful sorcerer and sends a massive storm against his brother Antonio, hoping to sink his ship and get revenge for being exiled. He strands the crew, consisting of Alonso, Ferdinand, and Antonio on the island, then summons his servant Ariel to help him watch them. His other servant is named Caliban, who tries to betray Prospero, attacking him. Meanwhile, Ferdinand and Miranda fall in love and decide to get married, but Prospero wants his daughter to have nothing to do with Ferdinand. Caliban joins up with two other men from the shipwreck to plot against Prospero, but Prospero stops him. Ultimately, Prospero forgives his enemies, even Caliban for being stupid. He lets his daughter marry Ferdinand and helps everyone off the island. Excuse this superficial summary for one of the greatest classical plays ever, but if you know Forbidden Planet, I think you’ll agree that there are similarities. To begin with, I would have to say that the planet Altair IV is like Prospero’s island, and it is a place where Dr. Edward Morbius lives in isolation with his daughter. Whether by choice or not is probably debatable, but Morbius is alone with Altaira, just like Prospero and Miranda. It’s exactly the same setup. Prospero controls magic and summons a storm to attack a ship at sea. Morbius doesn’t exactly “summon” the monster, but his unconscious self does, and it attacks the spacecraft and the visiting men. Just like Prospero has mastered magic, Morbius seems to have mastered technology. Or at least he says he has. The use of technology in Forbidden Planet represents the magic Prospero uses in The Tempest, albeit with less success. One of the visitors is John Adams, played by a young Leslie Nielsen. I enjoy Nielsen in this movie, but it is not the most emotional performance. 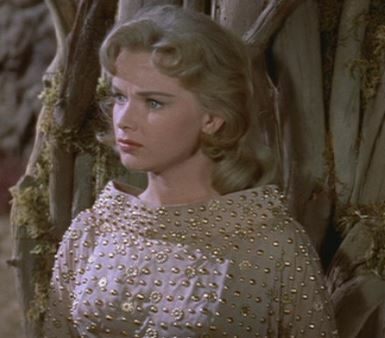 Of course, he is Ferdinand and he falls in love with Miranda, represented by Altaira, played by Anne Francis. She later falls in love with Adams and the two end up together at the end of the movie. 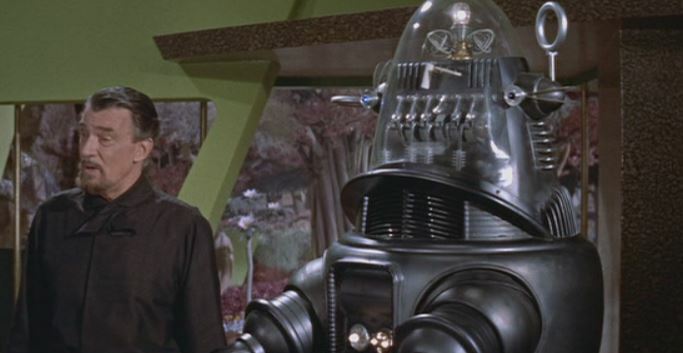 This movie is the first appearance of Robby the Robot, who inspired other science fiction robots in movies and television, most notably The Robot in Lost in Space. He is Ariel, a spirit of air summoned by Prospero to be his servant. Robby is helpful like Ariel and tries to obey his master’s commands. Ariel is a spirit of the air, merely a cloud wavering in the wind. The first appearance of Robby is as he drives up to the spaceshift in a cloud of dust, an obvious parallel. Being native to the wild island, Caliban represents The Monster, and both are untamed forces. Prospero tries to control him, but he cannot. At the end, Caliban refuses to serve Prospero and plots his death, attacking him for his cruelty, just like The Monster of the Id. Both the Monster and Caliban are natural forces, bent on destruction, but both encounter resistance. Prospero succeeds in using magic against Caliban, but Morbius doesn’t succeed in using technology against The Monster. The movie and the play teach two different lessons, which is where the main difference lies. Morbius may say that he has total control over technology, but he does not. In fact, he cannot do much to help the spaceship crew when his daughter asks for him to intervene, because he sees that his technology has gotten way out of control. The movie teaches that if humans want to control technology, they better control themselves first. The ending of The Tempest gives us the opposite lesson, building a harmony between nature and magic, and between all the characters. The Tempest has a happy ending, but Forbidden Planet ends with the destruction of Altair IV and Morbius. I hope that wasn’t too boring, because I can see now that Forbidden Planet is The Tempest. I’m not sure if this was done on purpose or not, but I’ll just assume it was for the purposes of my piece of mind. 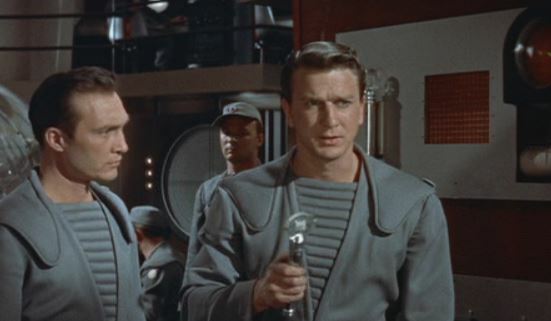 In any case, Forbidden Planet is a great movie. It has good effects for an early movie like this one, especially the animations done by Joshua Meador, who worked for Disney. The matte paintings are just perfect and the world looks beautiful. The saucer coming down to land at the beginning just looks awesome, come on, you have to admit that. Check out the picture at the top of the page to see for yourself. There aren’t many flaws or things lacking in the effects department, cause they went all-out to make it look as good as possible. This movie cost around 1 million dollars to make. Even the monster looks like you might imagine a realistic electric demon to be. I like this movie even more now that it has been stamped with some Shakespeare pedigree, but even if that doesn’t interest you, it is still a good science fiction adventure, filled with great visuals. It was supposed to be a take on tempest. Thats how it was advertised anyway.